MALIK, F. , FARHAN, S. , FAHIEM, M. A.
Alzheimer's is a neurodegenerative disease caused by the destruction and death of brain neurons resulting in memory loss, impaired thinking ability, and in certain behavioral changes. Alzheimer disease is a major cause of dementia and eventually death all around the world. Early diagnosis of the disease is crucial which can help the victims to maintain their level of independence for comparatively longer time and live a best life possible. For early detection of Alzheimer's disease, we are proposing a novel approach based on fusion of multiple types of features including hemodynamic, volumetric and textural features of the brain. Our approach uses non-invasive fMRI with ensemble of classifiers, for the classification of the normal controls and the Alzheimer patients. For performance evaluation, ten-fold cross validation is used. Individual feature sets and fusion of features have been investigated with ensemble classifiers for successful classification of Alzheimer's patients from normal controls. 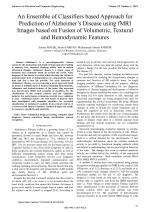 It is observed that fusion of features resulted in improved results for accuracy, specificity and sensitivity. 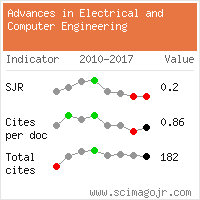 There are no citing papers in the CrossRef Cited-by Linking system. Website conception, design and maintenance by Eugen COCA. Content updated on 28 Feb 2019. Site engine updated on 28 Feb 2019. This page was generated on the server in 0.065 seconds and loaded in your browser in > seconds.